Bill Gates talks about life and success with his dad, Bill Sr., at 92 St Y. 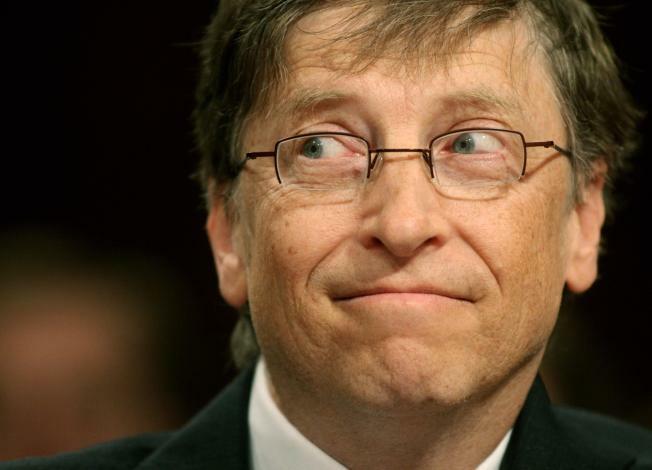 LIKE FATHER, LIKE SON: You take a look at software squillionaire Bill Gates and you think, where did a mind like that come from? Get a glimpse at (at least half) the answer as Gates interviews his pops at 92nd Street Y’s A Conversation With My Father. Expect Bill Senior to dispense many of the life-lessony pearls offered forth in his book “Showing Up For Life: Thoughts on the Gifts of a Lifetime.” 8PM. BLUE The Happy Ending Music Series once again pairs writers with musicians at Joe’s Pub. On the bill: Scribes Christopher R. Weingarten (Rolling Stone), Dan Kois (Vulture) and Geeta Dayal (“Another Green World,” from the 33 1/3 series) are joined by Moby’s side project, the old-bluesy Little Death, whom we’ve frothed about before. Their frontwoman, Laura Dawn, is a little Janis and a little Joan Jett. 7PM. BARE ESSENTIALS: When you first heard that the Naked Cowboy—of Times Square-in-yer-knickers fame—was going to be hosting a comedy series at Caroline’s, did you wonder whether he’d be wearing clothes? Yes, you did—and no, he won’t. The whole shebang kicks off tonight, with a roster of comedians, musical guests, and (one presumes) very minimal costume changes. 7PM.